Hi guys! Today was a great mail day with orders coming in from Vapid Lacquer and Frenzy Polish. I'll likely be posting some pictures on Instagram and Twitter before they end up on the blog so make sure to follow me (@rightonthenail on both). Tonight I have a polish I bought from the There is a Song Collection which is inspired by River Song from Doctor Who. I think I've discussed my love for Doctor Who in the past, but I was really sad when David Tennant left and Matt Smith stepped in. I guess you could say that things haven't been the same since. Also, did you hear that Steven Moffat is leaving?! On a brighter note, the polish Hello Sweetie is a stunning color. It's a lilac creme with lots of large silver flakes. I can easily say I don't own anything like it, and I love the flakes. You may be wondering if the flakes made the application difficult, but I had no issues at all. They also lay completely flat so I didn't need a really thick topcoat. This is a must have! The entire There is a Song Collection is for sale at Pahlish right now and Hello Sweetie retails for $11. Find out more about Pahlish on their website, Instagram, and Facebook pages. Hi guys! 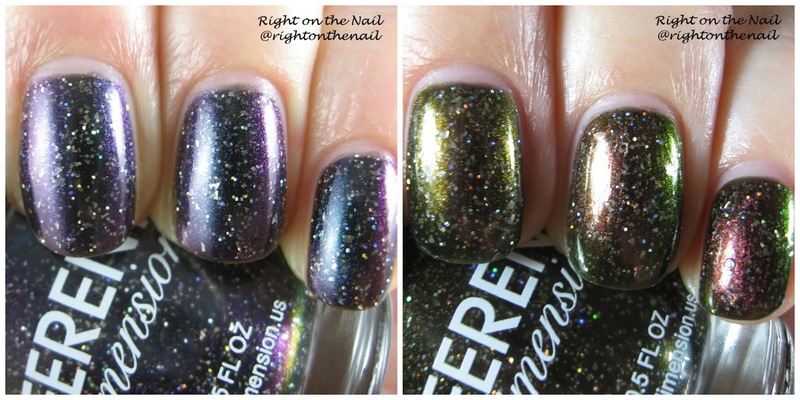 While going through pictures on my SD card I came across an Ever After Polish I forgot to post a few weeks ago. No time like the present if you ask me! Oh, and this polish is still available if you are interested in purchasing it. Steel Magnolias is a grey holographic polish with lots of silver flakes (it's easier to see the flakes in the second and third photos). Have I mentioned that I love grey polishes? Yeah, I really do, and this is no exception. It was a bit sheer, so I used 3 heavy coats for the swatches above. Otherwise, the formula was great. You can Steel Magnolias right now on their on their website for $11. Find out more about Ever After Polish on their website, Facebook page and fan group, Twitter, and Instagram. Hi guys! Did you have a good weekend? I say this pretty much every Monday, but I can't wait for The Bachelor tonight. 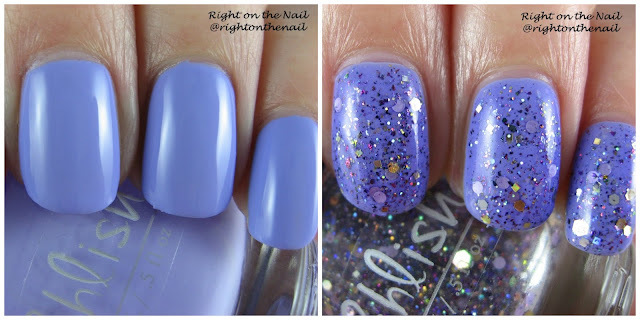 Shall we finish up the swatches from the Zoya Whispers Collection? Hi guys! TGIF! Do you have any special plans? I don't have anything special planned, but that's ok with me. Tonight I have the first three polishes from the Whispers Collection from Zoya. These are all soft cremes that are perfect for spring. Let's look a little closer at these polishes. Hi guys! I have a bad headache tonight so the post is going to be quick. The last 2 polishes from Different Dimension feature polishes that are currently not available, but don't fret, there are still so many beautiful colors for sale on their website. Hi guys! If you are on the east coast you may have had a snow day like I did today. I mostly just rested up, but it was still nice to have an unplanned 3-day weekend. Tonight is a great night of tv as well! The Grammy's, the Westminster Dog Show, and The Bachelor are all on tonight and of course start at the same time. Thank goodness for the DVR, am I right? 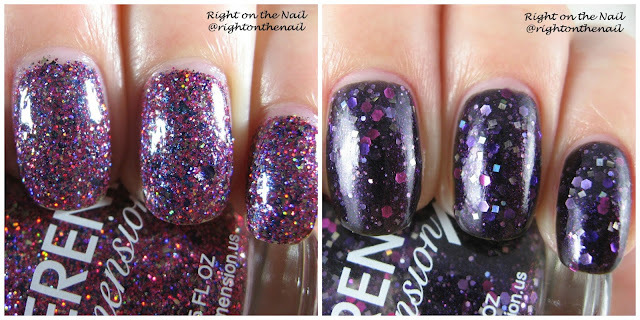 Let's continue on with my swatches from the indie brand Different Dimension with 2 colors from the One Small Step Collection. Hi guys! Since it's my first week back to work from my trip, I feel like the week is flying by (I had so much to catch up on!). Tonight I have another holographic polish from the indie brand Different Dimension called Let Your Gourd Down. It's a burnt orange color that I find interesting as a holo finish (which I love)! It's definitely in between brown and orange and reminds me of the color of pumpkin pie. The formula was perfect, and was slightly thicker than I Love You a Latte from Monday. Polish prices from Different Dimension vary based on the type of polish, but tend to be around $8.75-$12 for a full 15 mL bottle. The whole fall collection is currently still available on their site for $10 each. You can find out more about Different Dimension on their website, Facebook, or Instagram pages. I'm back, and let me tell you, I am very happy! I was sick in Cambodia the entire time. Yeah, it was pretty terrible, but we ended up getting all of our sampling done despite my illnesses. Tonight I have a new indie brand to the blog called Different Dimension. They've been around for awhile, but I just ordered from them for the first time during a recent sale. Right off the bat, I was really impressed with the bottles and label. There's just something about the white cap that gives it a modern feel, you know? The first color I have to show you is called I Love You a Latte from their Fall 2015 collection and is a medium latte brown holographic polish. It's definitely a linear holo, but it's not totally in-your-face holo like some brands like Cupcake Polish. The formula was slightly on the thin side without being watery at all, and only needed 2 coats for full opacity. I think this is such a beautiful neutral polish that is appropriate for all occasions. Polish prices from Different Dimension vary based on the type of polish, but tend to be around $8.75-$12 for a full 15 mL bottle. I Love You a Latte is currently still available on their site for $10. You can find out more about Different Dimension on their website, Facebook, or Instagram pages.